Scanning can now be accessed by using your phone apps. All it takes to scan is taking a photo within the camera version of your phone. The applications can also use preexisting photos that are saved on your devices. All three apps have options to change the image quality from (color, black and white, and original), resizing, and rotation features. Within the app you are able to email, upload to other sites (if you purchase the Pro version which is a one time $6.99 fee) and fax (with a small payment fee). There are 3 available apps for both Apple and Samsung products. The apps are compatible with phones and tablets. How do I use the Video Chat feature in BishopApps? How do I link my BishopApps and YouTube accounts? How to preserve my documents, calendars, sites, or blogs when my OWU account is deleted? How do I find out more information about OWU telephone dialing instruction? How do I find out more information about telephone general procedure? How do I find out Voice Mail Instructions? How do I find out more information about telephone features? How to find Media Center Hours and contact number? How to find out Media Center borrowing privileges and equipments? How to request media reserves? How to find out more information about media rental and purchase? How do I find out more external links related with iPad? 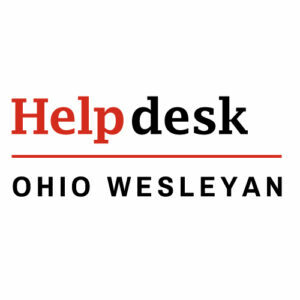 How do I find out more information about iPad from OWU helpdesk? How do I save images from browser to local iPad photo album? How do I print at OWU? How do I find out more information about PrintGreen? How do I do a Secure Print? How do I best collaborate with others online? Where can have a document scanned? How do I find a microlab or computer classroom on campus? How do I reserve the Technical Training Room? How do I find out OWU building addresses? How do I find out OWU Cable TV Channel Lineup? How do I connect Apple TV to the campus network? How do I find out OWU mail guidelines and options? How do I find out OWU general procedures for student mailroom? How do I use the Self-Service site to search for the course schedule? Are there systems on campus that Information Services does not support? How do I add an OWU event to my own calendar? How do I find a map to an OWU event? How do I subscribe to the OWU Events Calendar? Where do I get address or department info for mailing labels? 1. Go to http://my.owu.edu in a web browser of your choice. You will be asked to log in with your OWU username and password, unless your computer has already stored these and logs you in automatically. 2. Roll your mouse cursor over the Faculty and Staff menu item. 3. Click on Course Evaluations from the list that appears. 4. Select the course evaluation you wish to view. 5. Click the “Download selected” button. 6. Alternatively, you can download all course evaluation as a single PDF file by clicking the “Download all” button. You can download all course evaluation for a selected semester by clicking the “Download term” button after selecting the appropriate term. 1. Course evaluations are available electronically back through Fall 2010. No other historical records are stored in the database. 2. Course evaluation records will be retained for 10 years as stipulated by the *Faculty Handbook*. After that, they will no longer appear in your list of evaluated courses. 3. Paper copies of course evaluations will no longer be distributed. 4. Grand Totals summarizing all-faculty means and medians are included in every downloaded file. 5. Department chairs cannot view course evaluation records for part-time faculty online. Department chairs should contact Alice Winters to review course evaluations for the part-time faculty in their departments. If you have any questions or concerns about policy or have any difficulty accessing your course evaluations, please let us know. What’s Prezi and how do I use it?